This image was captured at a marsh in Maine at sunset. 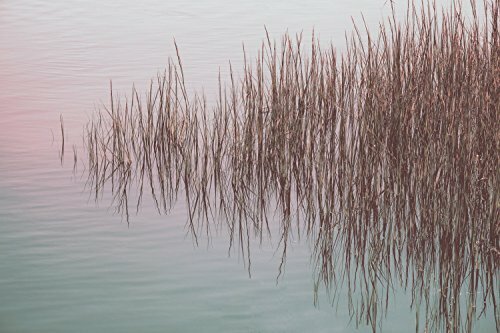 The reflection of the grasses in the water look like they are suspended on glass. Maine and New England in general offer some of the most beautiful nature photography opportunities. It's nice to find them at the right time of day. This would add an element of peacefulness, contemplation, rejuvenation to any room. If you have any questions about this product by Leslie Brienza Fine Art and Still Life, contact us by completing and submitting the form below. If you are looking for a specif part number, please include it with your message. Egret Photograph, Abstract Print, Blue and Brown Wall Art, Nature Photography, Bird Print, Coastal Wall Art, Beach Decor - "Great White Ghost"
Coastal Abstract Modern Canvas Wall Art - "Boardwalk Blue"